This page is intended as a source of information for patients suspected of or having been diagnosed with a spinal intradural fistula, also known as a pial fistula. Please remember to read the “Disclaimer” section — none of this information may be used to diagnose or treat any disease. This is for general information purposes only. Of course, I need to say that. For historical reasons, spinal fistulas have many different names for the same thing. Spinal pial fistula and spinal intradural fistula are synonyms. Another name is Type IV fistula. It is a relatively rare fistula (much less common than the Spinal Dural Fistula) and most patients, in truth, don’t learn the particular name for the fistula they have or had. Most are told that they have a fistula which needs to be treated because it bled or is causing problems with the spinal cord, such as weakness, numbness, problems with bowel movement or urination, sexual dysfunction, etc. However, it is important for patients to know what kind of fistula the patient has or had. For example, some patients with the “pial” fistula type have a genetic disease, of which the spinal fistula is only one part. “Fistula” means abnormal connection between two structures that are normally not connected. An arteriovenous fistula is therefore an abnormal connection between an artery and a vein. Any part of the body can have a fistula. A spinal intradural (or pial) fistula, is an abnormal connection between an artery and a vein that are located on top or just inside the spinal cord. This is different from the more common dural fistula, which is located next to a spinal nerve, and not next to the spinal cord itself. These differences are important. 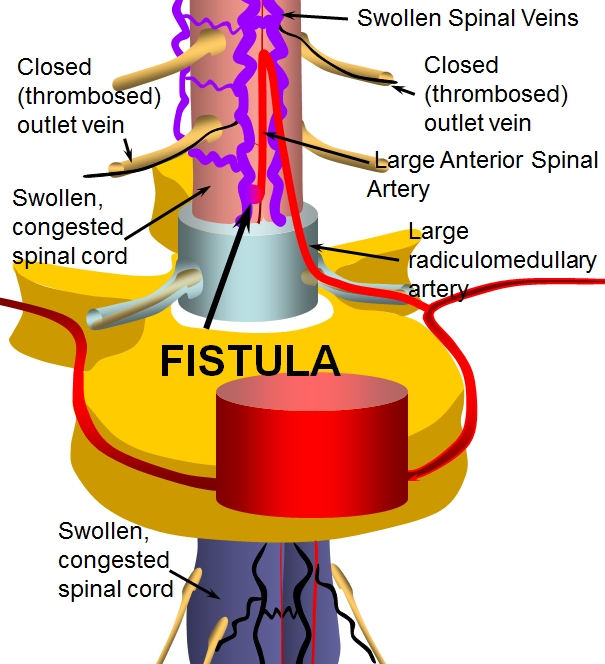 When a spinal fistula forms, blood from an artery that normally supplies the spinal cord and is not directly connected to a vein, becomes directly connected to a nearby spinal vein. When this happens, arterial blood, which is under high pressure and high flow, flows immediately into a vein, which is normally under low pressure and slow flow. The result is that the veins are getting a lot more flow, under much more pressure, than they are designed to handle. The veins become large, tortuous, and weak. Also, because the fistula dumps a lot of blood into the veins, the pressure in the veins goes up. This creates a backup, so that other spinal veins have a hard time draining. The result is venous “congestion” of the spinal cord. The cord becomes swollen and dysfunctional, which is one way patients start having symptoms. Also, the weak veins next to the fistula can burst, which leads to bleeding (hemorrhage) either into the spinal cord or into the fluid around it (spinal subarachnoid hemorrhage). This is different from the more common Spinal Dural Fistulas, which do not bleed, but cause dysfunction through venous congestion only. The following illustration shows a normal situation. The spinal cord receives most of its blood from the “anterior spinal artery”, a thin but critically important artery that stretches along the length of the entire cord. From there blood circulates into the cord capillaries, where nutrients and oxygen are exchanged for spent fuel, carbon dioxide, and other products of metabolism. 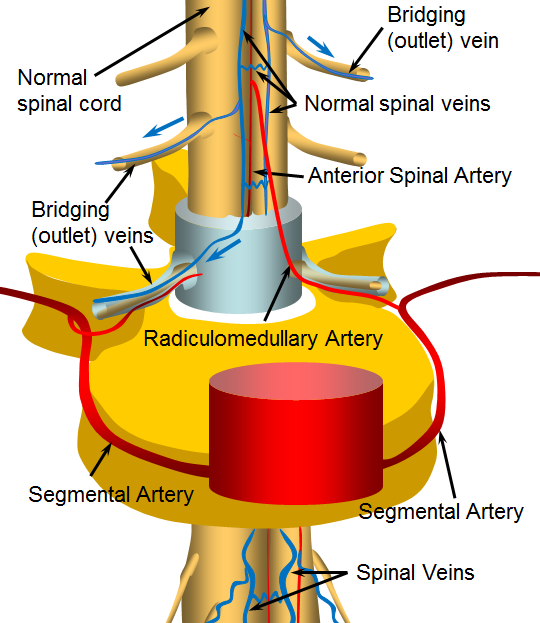 The blood continues to circulate into venules, then into bigger and bigger veins that ultimately converge, like many streams, into “rivers” on the surface of the cord, which are labeled on the picture below as “Normal spinal veins”. From these veins, blood is taken away through “bridging veins” out of the spinal canal and ultimately back to the heart. As you can see, there is no direct connection between arteries and veins. The connection has to go through a large network of capillaries (not shown). Now, below is an illustration of a “fistula”. The fistula is an abnormal connection between the anterior spinal artery and spinal veins (other arteries also supply the cord, and may be involved in a fistula — the picture is for illustration of the concept). When this happens, much more blood under much higher pressure is pumped directly into the veins, bypassing the capillaries. The veins are not designed to deal with this much pressure or volume. They enlarge (swell) to accommodate the extra blood, becoming tortuous (wavy) and try to hold the pressure in check by thickening their walls. Over time, the veins actually become weaker, as adaptive mechanisms fail. Points of weakness develop on both arteries and veins, sometimes ballooning into large sacks called “aneurysms”. These aneurysms, or even parts of arteries and veins with weak walls can burst, causing bleeding either into the cord or around it. Even when no bleeding happens, the swollen, large spinal veins are a problem because they are under high pressure. This means that the blood which supplies the spinal cord also must be under higher vein pressure to exit into the cord veins. This creates a condition called “venous hypertension” — different from the more usual arterial hypertension we all know about. Finally, the “Bridging” or outlet veins which take blood away from the cord and back to the heart tend to fail when fistulas are present, for different reasons. This makes venous congestion even worse and increases the chance that the patient will start to feel the effects of the fistula. Spinal pial fistulas, again, are different from spinal dural fistulas. We really don’t know what causes spinal dural fistulas. In truth, we also don’t know what causes pial fistulas either. However, what we do know is that some patients with pial fistulas, as well as spinal AVMs, have an underlying genetic disorder (unlike patients with spinal dural fistulas, which almost always do not have a genetic problem). Of course, this does not mean that all patients with pial fistulas have a genetic issue. But some do. Some of it depends on the complexity of the fistula (the more complicated the fistula, from the anatomical point of view, the more likely there is a genetic abnormality). Some patients with fistulas already know about a genetic problem, but others do not. It may be important for these patients to be evaluated by a geneticist. The point here is not to scare readers into thinking they have a genetic disease. Many patients with a spinal fistula do not have a genetic issue, and the fistula is an “isolated” problem. And, again, this discussion only applies to patients with pial (intradural) fistulas, which are much less common than the spinal dural fistula. So, the bottom line is that patients who have a specific diagnosis of a pial fistula or spinal AVM might benefit from a genetic evaluation. Not all genetic diseases are “hereditary” — meaning passed on from parents to children. Some are “sporadic mutations” — meaning that the mutation arose “de novo” — by itself — without being passed on by the parent or parents. Examples of conditions associated with intradural (pial) fistulas and spinal AVMs are Parkes-Weber syndrome, Capillary Malformation-Arteriovenous Malformation Syndrome (CM-AVM Syndrome), Klippel-Trenaunay Syndrome, and Hereditary Hemorrhagic Telangioectasia (HHT) (also known as Osler-Weber-Rendu), among others. The Spinal Intradural (Pial) Fistula page has a more in-depth discussion of the pathophysiology, genetic associations, evaluation, and treatment of the fistula, as well as some angiographic examples. Patients with pial fistulas can have different symptoms, depending on what kind of problem the fistula is causing. Bleeding is usually a very dramatic sequence of events, which usually starts with back pain and quickly leads to either paralysis or significant weakness/numbness. Usually there is no question that something is very wrong, and the patient is taken emergently to a hospital. Bleeding symptoms are different from those of venous congestion. Venous congestion usually happens gradually (unlike bleeding). Patients can feel all kinds of things, including back pain, numbness in arms or legs, stiffness, weakness, difficulty with urination, bowel movement, sexual dysfunction, etc. for some time (weeks, months, years) As you can see, many of these symptoms (such as back pain) are very common. 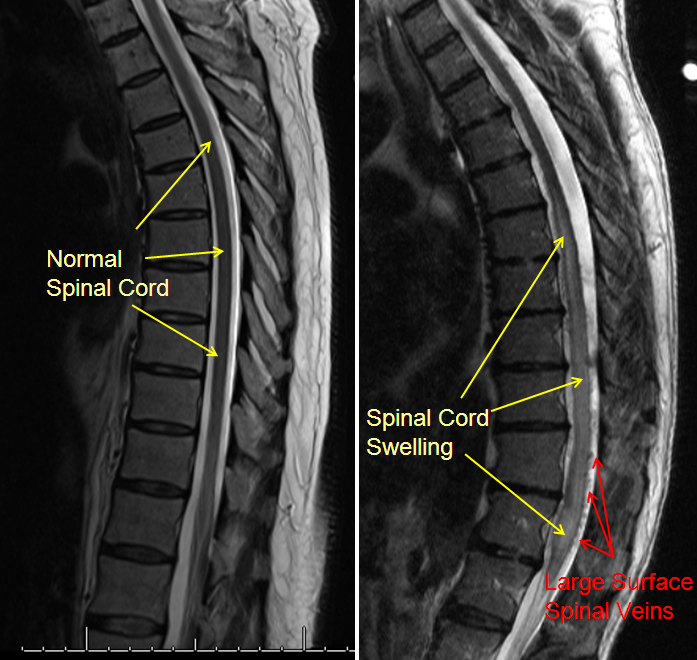 Most patients with back pain, or even paralysis, do not have a spinal fistula (spinal fistulas are very rare). It is not reasonable to think that one has a spinal fistula because one has pain or stiffness or numbness. There are usually other reasons for these symptoms — some dangerous, and others less so. But these symptoms require an evaluation, which means going to a doctor (a general practitioner is a good place to start, and often a neurologist needs to see the patient also). The doctor takes a history, performs a neurologic examination, and takes it from there. Today, most fistulas are diagnosed by MRI imaging. Fortunately, most fistulas have a characteristic MRI appearance, which is different from the more common back problems like herniated disks and osteoarthritis and spinal stenosis. The “hallmark” of the fistula on MRI is seeing too many large vessels surrounding the spinal cord. When too many vessels are seen like this, the dianosis of a fistula or other vascular problem of the cord should be considered. Most will end up being “dural fistulas” rather than intradural ones, and some may end up being normal after all. MRI usually cannot tell what kind of fistula the patient has, or where the fistula is, only that a fistula is present. To get a specific diagnosis and plan treatment, a spinal angiogram is required. It is important to get a high quality MRI exam — which means a modern machine with a “field strength” of at least 1.5T (Tesla). Not all MRI machines are equal — just like there are old, run-down cars and new and generally better cars, so it goes with MRI machines. Although many patients would rather be in an “open” magnet than a “closed” one, the “closed” types typically produce much better pictures. Consult your local MRI place for more information. Also, the MRI has to be correctly read by an expert radiologist. The vast majority of fistulas can be treated either through catheters (neuro-interventional techniques) or by surgery. Most are treated through catheter embolization, sometimes at the same time as the spinal angiogram, so that both diagnosis and treatment can be carried out during the same procedure. To treat a fistula, a very small catheter is inserted into the fistula or very close to it, and the fistula is plugged up with a glue-like substance. If this treatment is not possible, for one of several reasons, the patient can have the fistula closed by having special spine surgery. Overall, the vast majority of fistulas we see are cured through one of these two ways. Whether the fistula is cured by endovascular (catheter) or surgical means, the treatment should only be undertaken at specialized centers having extensive experience with this particular condition, as details of treatment are usually quite complex. The details of treatment are best discussed with the specialist who will be treating the fistula. Once the fistula is closed, spinal cord blood circulation gets better, but usually does not go back to normal. The patient’s symptoms may go away completely, partially, or not at all. The extent of eventual improvement depends on duration and severity of pre-treatment symptoms, individual anatomy, and other considerations. Overall, most patients get better. The converse is that, without treatment, virtually all patients get worse and will be eventually paralyzed. For this reason, we strongly recommend that essentially all patients with dural fistulas be evaluated for treatment. Patients with bleeding can also recover substantially. 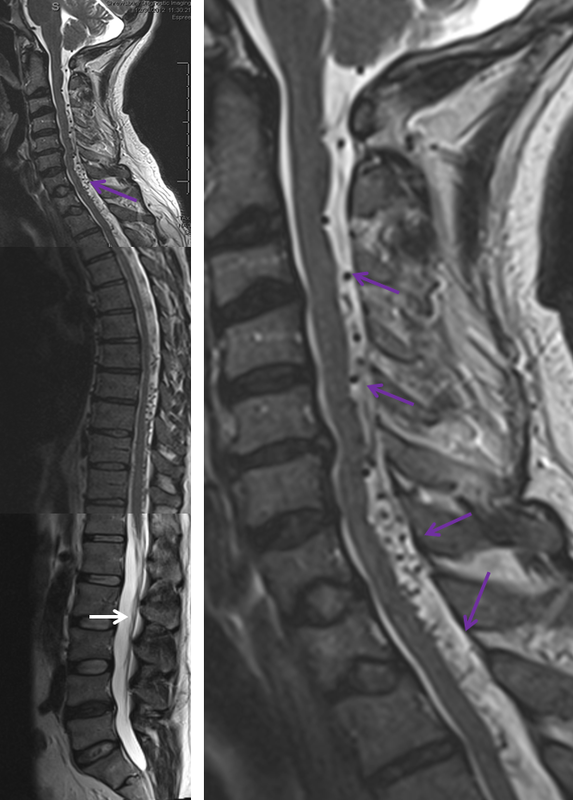 Another MRI of a patient with a spinal fistula, showing many more veins (arrows) around the spinal cord than should be normally seen, is shown below. 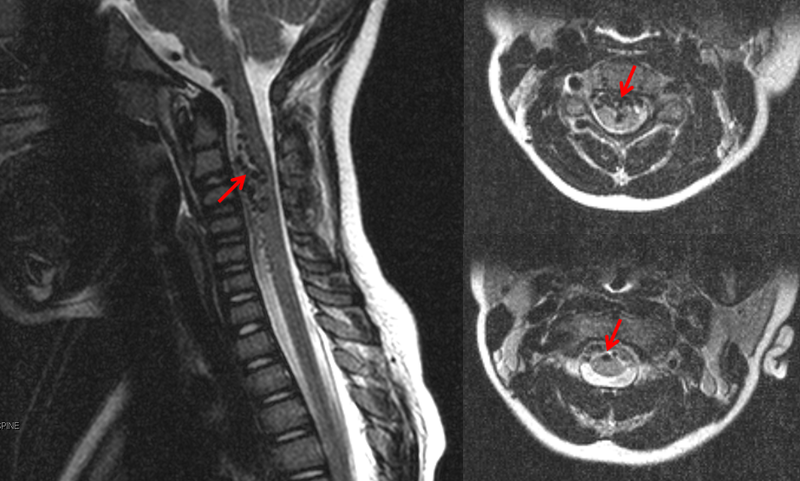 MRI below shows a collection of large vessels in front of the cervical (neck) spinal cord. 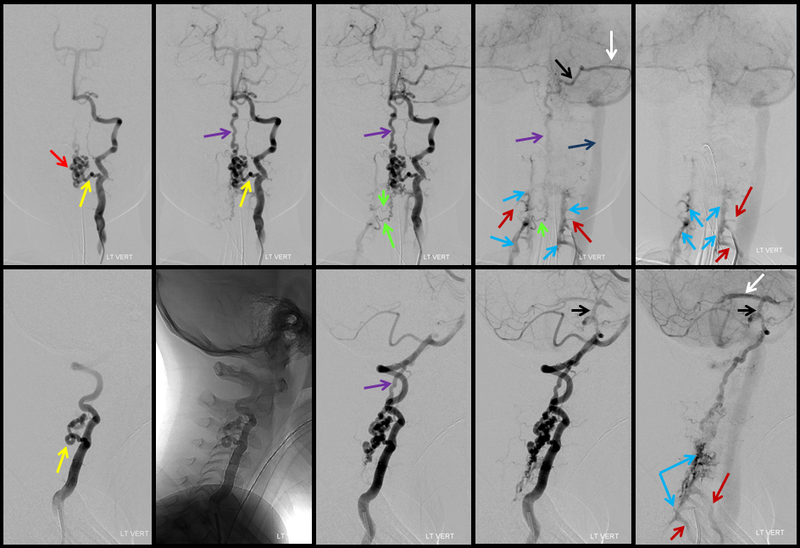 Images from a spinal angiogram show the area of the fistula (red arrows), as well as a wealth of information not seen on MRI (other arrows). More extensive information and technical discussion is available on the Spinal Intradural Fistulapage. More technical, professional-oriented information on the topic of the intradural fistula may be found in the “Spinal Intradural Fistula” division of the “Spinal Vascular Anatomy” section.